We’d love your help. Let us know what’s wrong with this preview of On the Blue Train by Kristel Thornell. What really did happen to Agatha Christie during her mysterious eleven-day disappearance just as she was on the cusp of fame? An entrancing novel of creativity and grief. Yes, she said, finally. Breaks are important. There are times when it's wiser to get away. From it all. It was the work of a moment, on 4 December 1926, Agatha Christie of London became Teresa Neele, reside What really did happen to Agatha Christie during her mysterious eleven-day disappearance just as she was on the cusp of fame? An entrancing novel of creativity and grief. It was the work of a moment, on 4 December 1926, Agatha Christie of London became Teresa Neele, resident of the spa hotel, the Harrogate Hydro. With her wedding ring left behind her, and her minimal belongings unpacked, Agatha's lost days begin. Lying to her fellow guests about the death of a husband and child, Teresa settles in to the anonymity she so fiercely desires. Until, Harry McKenna, bruised from the end of his own marriage, asks her to dance. To ask other readers questions about On the Blue Train, please sign up. With another guest joining their dinner table, Teresa came to know Harry McKenna. A gradual if reluctant friendship (on Teresa’s side) ensued – Harry felt deeply attracted to this enigmatic woman; but also guilty as he’d just lost his own wife in a tragic manner. As the hotel guests used the spa as well as the treatments on offer, many vowed they felt much better. But although Teresa’s physical health improved, the same couldn’t be said for her mental health. Would anyone discover who Teresa really was? Would Harry? On the Blue Train by Aussie author Kristel Thornell was a wonderful historical fiction novel woven around the real-life disappearance of Agatha Christie back in 1926. A story of what might have happened, blended with what did happen – On the Blue Train is sad, and definitely uplifting! There’s tragedy and hope, love and grief; happiness and laughter – all beautifully written in an enchanting way. A thoroughly enjoyable read which I highly recommend. With thanks to Allen & Unwin for this copy to read in exchange for my honest review. 2 1/2 stars. I was discombobulated by the book. The language was choppy and abrupt with a disconcerting turn of phrase. The book was as much about another guest at the Hydro Spa, Harry McKenna, pyschoanalysis as it was about Agatha Christie's missing two weeks. A story of human frailty and sadness, not the mystery I was expecting. As well as being a novel about what may have happened to Agatha Christie during the 11 days in which she disappeared in December 1926, this is a novel about love relationships. What makes these deep relationships work and what can make them untangle. In this sense, this sensitively written and thoroughly researched work by Vogel Literary Award winner Kristel Thornell endeavours to explain what led to the breakdown of Agatha Christie’s first marriage, and her ensuing mysterious disappearance. Agat As well as being a novel about what may have happened to Agatha Christie during the 11 days in which she disappeared in December 1926, this is a novel about love relationships. What makes these deep relationships work and what can make them untangle. In this sense, this sensitively written and thoroughly researched work by Vogel Literary Award winner Kristel Thornell endeavours to explain what led to the breakdown of Agatha Christie’s first marriage, and her ensuing mysterious disappearance. Agatha Christie herself never spoke of the 11 days in which she disappeared, not even in her autobiography. Many theories have put forward as to why she did it: everything from it being a publicity stunt to further her (at that stage) fledgling career as a writer, to a more serious medical explanation; a form of amnesia where someone goes somewhere for a period of time but has no recollection of it. Indeed the undisputed Queen of Crime’s disappearance may be her biggest mystery, and one that she herself was unable to solve. Christie disappeared shortly after her first husband, Colonel Archie Christie, announced he was in love with golfer Nancy Neele and wanted a divorce. Agatha and Archie had a young daughter called Rosalind, and Agatha apparently did her best to dissuade her husband from leaving her. Little is mentioned of Rosalind in this work, except a few pages where Teresa laments that “mother and daughter were too unlike for their love to be altogether natural.” There seems to be a real sadness that her daughter is closer to her husband. Checking into a hotel under a pseudonym that used the surname of the woman her husband had fallen in love with, Teresa Neele, Agatha Christie became a resident of the Harrogate Hydro Hotel for 11 days as searches of up to 1000 men were mounted to look for her. Stories about her disappearance appeared in the newspapers almost daily and even made the front page of The New York Times, but amazingly, none of the hotel guests recognised her. In this novel Agatha enjoys the freedom on anonymity by going shopping with other hotel guests, visiting baths and generally enjoying herself. It is believed a musician in the band at the hotel eventually recognised her and reported her to police. In this account of what might have happened during those 11 days, Agatha is befriended by a young single man called Harry who quickly becomes enamoured with her. They are both going through heartbreak: his wife left him recently. The story hinges on their unfolding relationship. As they become friends they share their grief, uncertain as to how their relationship should proceed. Harry realises early on that ‘Teresa’ is the missing novelist the newspapers have been reporting missing, and Thornell creates wonderful tension as he wonders whether to let on. What will Teresa do if she realises he knows her secret? That said, Thornell undertook extensive research for this project. She credits Agatha Christie’s autobiography as a source, as well as books that have been written on Agatha Christie by Janet Morgan and Laura Thompson, a book extensively edited by Mathew Prichard and materials from the Christie archive at the University of Exeter. •	Agatha Christie disappeared for 11 days, from 3 – 14 December 1926. •	During this time she stayed at Swan Hydro, now the Old Swan Hotel, in Harrogate in England. •	Agatha’s husband, Colonel Archie Christie, fell in love with Nancy Neele. •	Agatha checked into a hotel under the name of Teresa Neele, using the surname of the woman her husband had fallen in love with. •	She had a real-life infatuation with an Australian, Frick Bell, when she was in Queensland in 1922. •	A large search for Agatha Christie was mounted by police and the newspapers ran stories on her disappearance daily. Thornell’s insight into human nature is every bit as astute as the Queen of Crime herself. There is great attention to detail and nuance in this carefully considered work, which I would personally classify as an historical fiction literary novel. Harry’s first impressions of Agatha (Teresa) are very perceptive: “Teresa Neele was alone and apparently reclusive, and maybe wilted…she was singular in a way he couldn’t identify…he couldn’t let go of the impression that she was suffering, or endangered. It quickened his heart. But Teresa explains it easily, saying she left the bulk of her luggage with dear friends in Torquay as she isn’t sure how long she’ll be staying in Harrogate. “I decided it would be simpler for the time being to just buy a few things here,” she says. Teresa uses her considerable imagination and intelligence to deflect questions from fellow travellers; a woman travelling alone in the 1920s would have been quite unusual. She invents a husband and child who have both passed away, knowing full well that etiquette of the day would have forbidden further questioning. Although it’s difficult to someone like Agatha Christie having writer’s block, a recurring theme of the book is ‘Teresa’s’ angst at wanting to write a letter to her husband but not knowing what to write. (The illusion of being Mrs Neele is unbroken as she refers to her husband as ‘Mr Neele’). “She sat down at the writing table to see whether she could dispatch the postponed letter to Mr Neele. A quick note might be sufficient. Ideas for a new book swirl around in her head, but she can’t get that down on paper either. Something about a woman on a train who gets killed. In real life, we know that Agatha Christie’s The Mystery of the Blue Train was published in 1928, two years after her disappearance. Among other things, Teresa and Harry go for long walks, and on one of them she reveals her detailed knowledge of poisons - strychnine, mercury bichloride, opium, morphine and laudanum - explaining that she once worked in dispensary, (Agatha Christie worked in a dispensary during Word World I and it was here that she developed her knowledge of poisons), and scarring poor Harry, who worries she may be planning to harm herself. The days go past, and Teresa tries to resolve what she should do. She seems to be in a cozy bubble, a timeless state, not worrying about the future or where she is or what she should be doing. Thornell has created a floating sense of denial as Teresa fills her days. She keeps her thoughts to the surface and only towards the end of the 11 days does she allow herself to think about the other woman. “If you were to consider the mind as a train, you might say she had simply sat for a while in a different compartment to the one she normally occupied as a wife. Such adjustments happened more easily when one was away from home. They were natural and perhaps necessary for successful travel. To contentedly inhabit new surrounds, one had perforce to turn away from certain habits, preferences, affections, and so on. She was a good traveller, predisposed. “In the compartment in which she traversed an afternoon storm with Shy Thing it was disclosed to her that she had been missing something. Badly. For it was still possible, at thirty, to feel altogether alive in the company of a man, for her dreaming heart and her skin to lean together. The smallest gesture between two people could still have a bite that seemed part animal, part mythical. She was shocked to have nearly forgotten that. Tension builds to an almost fever pitch as Harry confronts Teresa about her identity. What does the future hold of each of them? But the days go by, and he does not come. Thornell borrows some of the real-life details as to what happened when Teresa’s husband eventually does come to get her. The hotel is swarming with police and reporters, and Agatha, wearing double-stranded pearls for further reinforcement appears. Her walk is “that of a reinstated monarch,” and she gives a “little gallant toss of the head” as she steps in the taxi that will take her away. This wonderful book is a testament to Thornell’s innate writing ability. She is faithful to the lovely language of the day, with phrases such as “he was elderly and moustachioed” creating a wonderful evocation of yesteryear. Her ability to create tension and mystery in cozy surrounds – just as Agatha Christie did herself in all 66 crime novels – is tantalising and addictive. And even more importantly, Thornell she captures Agatha Christie’s amazing sense of humility. In real life, apparently no one was more surprised than Agatha Christie herself when she became famous. Yet she was an incredible writer: the Guinness Book of Records list her as the best-selling novelist of all time, with some 2 billion copies of her books sold. Agatha Christie would be proud. ** Postnote: Agatha Christie later married archaeologist Sir Max Mallowan. They remained happily married until her death in 1976. She accompanied Sir Mallowan on many digs in Egypt, and this led to a number of her books being set there. *** The character of Miss Marple first appeared as a character in Agatha Christie’s novels in 1930, four years after her disappearance. I'm of two minds about this book. I really enjoyed her writing style and especially how she interwove tidbits about the trials and tribulations of being human. And yet, at the same time, I wasn't really engaged and had a hard time sticking to it. The two main characters who were supposed to be in their mid-thirties felt like they were in their mid-fifties and I didn't really care about them. Overall I'd say it was alright and I might give her another go. This book had an intriguing premise but didn't draw me in as I'd hoped. The story is slow moving, with more focus on the development of the central characters. While these characters are well-drawn and believable, I struggled to relate to them, which I think was why I didn't enjoy the book more. However, the writing is beautiful, and the author has shown considerable skill in the gentle revealing of deeper and deeper layers of Teresa and Harry's pasts. Blending fact and fiction, Kristel Thornell’s On the Blue Train seeks to account for Agatha Christie’s movements during her disappearance, and in doing so weaves a moving story of grief, love, healing and creative life. I was intrigued by Thornell’s premise. I love novels, such as Hannah Kent’s Burial Rites and Therese Anne Fowler’s Z, that explore the lives of notable women who were unable to share their stories during their lifetime. 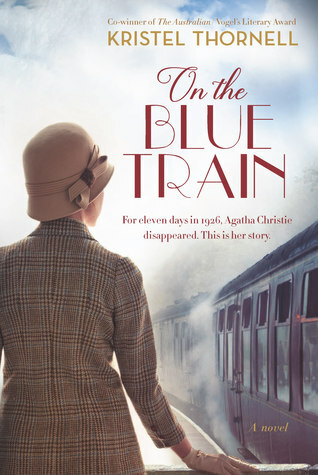 I’ve always been interested in learning what happened to Chri Blending fact and fiction, Kristel Thornell’s On the Blue Train seeks to account for Agatha Christie’s movements during her disappearance, and in doing so weaves a moving story of grief, love, healing and creative life. I was intrigued by Thornell’s premise. I love novels, such as Hannah Kent’s Burial Rites and Therese Anne Fowler’s Z, that explore the lives of notable women who were unable to share their stories during their lifetime. I’ve always been interested in learning what happened to Christie during her eleven-day disappearance and what she was thinking during that time (the most popular theory is that she was in a fugue state). However (and I’m ashamed to admit this), I’ve read very little of Christie’s work. Just one or two books, and not recently. Consequently, I worried that On the Blue Train would be one for the fans and riddled with references to Christie’s novels that I wouldn’t understand. Not so. Or, a least, any references were so subtly alluded to that they slid beneath my notice. The exception being the title, which takes its cue from one of Christie’s titles, The Mystery of the Blue Train (1928). In Thornell’s novel, Christie has become stuck while trying to formulate the plot for her Blue Train. Namely, she isn’t sure what to do with her female lead. Her first instinct is to kill her off, but she can’t seem to make that plot work. However (and I hope this isn’t just me reading into the text), Thornell’s use of Blue Train also refers to Christie’s ‘blue’ mental state at the time of her disappearance. Christie’s marriage is falling apart, she’s grieving for her dead mother while struggling to negotiate her own role as a mother, she feels middle-age is beginning to wilt the bloom of her youth and she can’t write. However, the story fundamentally belongs to Teresa and her relationship with Harry comprises one aspect in a complex portrait of a woman in crisis. Thornell takes a sensitive and nuanced approach to exploring what it meant to juggle the domestic roles of wife, daughter and mother with the professional role of crime writer in 1926, which was both the golden age of crime fiction and a time when most believed that a woman’s chief obligation was to her family and the running of her household. If I have one criticism of On the Blue Train, it’s the that the pace is a little slow, particularly in the early chapters. The story frequently drifts into reverie and reminiscence, and while this supports the story’s melancholy mood and premise of a woman stalled, it may feel a tad sluggish to Christie fans who delight in a twisting plot. Although, maybe this is unfair. With Christie as the subject, I went into On the Blue Train expecting a nod towards the mystery and suspense of her novels. Consequently, it took me awhile to reconcile that I was, in fact, reading a very different kind of book. I also have to admit to entertaining uncharitable thoughts about the cover. To me, it screams what publishers term ‘women’s fiction’: light, whimsical and with just enough mystery and romance to get your pulse up without upsetting your delicate sensibilities or making you think too hard. Call me a literary snob, but if Thornell hadn’t won the Vogel, I probably would have given this one a miss. And that would have been a great shame because On the Blue Train is a poignant and thoughtful story that’s lingered with me in the days since I finished reading. It’s also beautifully written. Thornell has a talent for conveying complex emotions and situations through strikingly simple images. And, while it’s cliche to say it, I found myself lingering over her sentences, reluctant to let them go. Going in, I expected a light, intriguing read and was pleasantly surprised to find On the Blue Train to be deep and quietly devastating. I can’t speak to its historical accuracy (and honestly, I have no interest in picking over what’s fact and what’s fiction), but as a novel On the Blue Train is both haunting and compelling and I’d recommend it to Christie devotees, but also to anyone who’s struggled with grief and loss, suffered a personal or artistic crisis, or merely found themselves overwhelmed and unsure about how to proceed. Thank you to Allen & Unwin for providing a copy of On the Blue Train in exchange for an honest review. It took me longer than expected to read this book, an imagining of the celebrated 11-day disappearance of the author Agatha Christie, a mystery which remains unsolved to this day. Kristel Thornell’s On the Blue Train is not a whodunit, it’s a whydunit, and it’s basically a slow meditation on relationships, past, present and emerging. Like most books creating fiction from the life of a real person, it is IMO best read on its own terms rather than fossicking around to see how it matches up with wha It took me longer than expected to read this book, an imagining of the celebrated 11-day disappearance of the author Agatha Christie, a mystery which remains unsolved to this day. Kristel Thornell’s On the Blue Train is not a whodunit, it’s a whydunit, and it’s basically a slow meditation on relationships, past, present and emerging. Like most books creating fiction from the life of a real person, it is IMO best read on its own terms rather than fossicking around to see how it matches up with what is known of the real life. Since nothing is known anyway about how Christie under her alias Teresa Neele spent her eleven days at the Harrogate Hydro, the plot allows for the creation of an assortment of characters, much like any of the ‘hotel novels’ I have read, hotels in this genre being the sort of places where well-heeled people stay for quite long periods of time, and crucially, offering opportunities for the characters to get to know each other. (See Hotel du Lac by Anita Brookner, In a German Pension by Katherine Mansfield, or The Little Hotel by Christina Stead). It’s often a feature of novels set in these hotels, that the characters have something to hide. While they might go out to see the sights, as Thornell’s characters do, that’s not why they are there. In On the Blue Train they are running away from themselves, hoping to reinvent themselves in some way. The characters who impact most on Teresa Neele are running away from unspoken grief, as she is, and so they circle around each other, unsure as to whether they can unburden themselves to someone they barely know. What really did happen to Agatha Christie during her mysterious eleven-day disappearance just as she was on the cusp of fame? “On The Blue Train” is an interesting interpretation into the disappearance of Agatha Christie on 4 December, 1926 who took on a different identity. Escaping her past, Teresa decides to take a break away from it all and becomes a resident of the spa hotel named Harrogat What really did happen to Agatha Christie during her mysterious eleven-day disappearance just as she was on the cusp of fame? “On The Blue Train” is an interesting interpretation into the disappearance of Agatha Christie on 4 December, 1926 who took on a different identity. Escaping her past, Teresa decides to take a break away from it all and becomes a resident of the spa hotel named Harrogate Hydro. It is here she meets and becomes friends with another resident of the hotel, Harry McKenna who shows her how to dance and enjoy life again. This is a novel about white lies to protect ourselves and truths be known. It is a dark and brooding novel which moves from France to England taking us on a ride through Agatha Christie’s twelve day disappearance and what could have happened. I thoroughly enjoyed this book and I rated it 4 out of 5 stars – special thanks to Allen and Unwin Publishers for sending me an Advanced Review Copy in exchange for my honest review. I really recommend this book!!! Well written, well researched and an imaginative way to look at the 11 day disappearance of Agatha Christie. I did find it started out a little bit slowly and took awhile for me to get interested, but after a couple of chapters I was hooked. 'On the Blue Train' is a well-written and very interesting book. Kristel Thornell cleverly developed an engaging mystery based on the real life disappearance of Agatha Christie. Magnificently written. Kristel Thornell has a poetic, detailed and vibrant way to portray characters and scenes. This book is surely going to amaze you! I didn't enjoy this book as much as I thought I would. It did seem to drag a little. I learnt a little about Agatha Christie and her time spent at the health spa. An average story. Thornell takes the 11 day disappearance of Agatha Christie in 1926 and tells her own version of events that were never explained - certainly not by the famous writer. What she comes up with is believable but I found both the writing style and the management of 'present' and 'past' sequences awkward at times. There were some lovely phrases and sensitive insights into troubled characters but they seemed the exception. Christie never did write a novel called 'The Blue Train' so I was uncertain abou Thornell takes the 11 day disappearance of Agatha Christie in 1926 and tells her own version of events that were never explained - certainly not by the famous writer. What she comes up with is believable but I found both the writing style and the management of 'present' and 'past' sequences awkward at times. There were some lovely phrases and sensitive insights into troubled characters but they seemed the exception. Christie never did write a novel called 'The Blue Train' so I was uncertain about the choice of title. Was it a reference to the depression that Christie was no doubt suffering or was it to the novel she was trying unsuccessfully to begin? Thornell did use the idea of trains, compartments and travelling quite cleverly in taking her story forward (or backwards) - it was one of the things I liked most about the book. I also became quite fond of Harry - the 'romantic' interest. I wanted to thank Goodreads Giveaways and Allen and Unwin for sending me a copy of On the Blue Train. It took me a while to review my First Reads reading but here it is. I wasn't aware of the real Agatha Christie when I started reading this book. With nothing to compare it to and reading is purely as fiction, I found the story to be interesting. Great writing by Kristel Thornell - I found the scenes to be very lively and its characters. I also had to check the dictionary a few times, which made I wanted to thank Goodreads Giveaways and Allen and Unwin for sending me a copy of On the Blue Train. It took me a while to review my First Reads reading but here it is. An enjoyable imagining of Agatha Christie's 'missing' eleven days. There is something dreamlike and meandering in the writing that is beguiling once you let yourself relax into it. I loved this book and was sad for it to end...Thornell is a master at making you feel you are an onlooker. Her other writings are awesome as well. 2.5 stars Interesting premise ...a fictional account recreating the real life mystery of the disappearance of Agatha Christie. Beautiful prose but quite a long winded plot ...found myself struggling at times to persist ..little mystery here ....all in all quite like a seemingly never ending train journey where the final destination is known! Agatha Christie's disappearance in 1926 kept a nation enthralled - what better mystery than the Queen of Crime suddenly dropping off the face of the planet, for no obvious reason. Whatever her reasons for taking a break, this novel offers one of many possible scenarios that captures the 1920s lifestyle and era superbly. There was a good interview with the author on 666 ABC this morning.. 09-11-16 sounds like a good read! Kristel Thornell has concocted a story that takes place during December 1926 and is predominantly situated in the fashionable spa resort town of Harrogate. She has extrapolated well-documented events concerning the author Agatha Christie and her first husband Archie Christie, and cleverly entwined the actualities with possibilities and fabricated the types of people who could have been in Harrogate at the same time. In December 1926, Agatha Christie disappeared from her home and was “found” eleve Kristel Thornell has concocted a story that takes place during December 1926 and is predominantly situated in the fashionable spa resort town of Harrogate. She has extrapolated well-documented events concerning the author Agatha Christie and her first husband Archie Christie, and cleverly entwined the actualities with possibilities and fabricated the types of people who could have been in Harrogate at the same time. In December 1926, Agatha Christie disappeared from her home and was “found” eleven days later in Swan Hydro Hotel in Harrogate. There was a bit of a scandal, a nationwide police search and immense media speculation, however, the mystery was never resolved, thereby spawning a singular plot to exploit. As the story develops, we realise how depressed and alone Teresa is feeling. She is still grieving the death of her mother and overwhelmed by sadness after going through the family house and all of her family possessions. She is also suffering from writer's block, but her mind is confused and she has forgotten (p58) “she realised that she herself was writing a book about a train, "Le train bleu". A wretched train wreck of a book.” In the intervening time, her husband had requested a divorce and she suspects that there might be another woman involved and not just his love of golf. Could all of these have instigated her bizarre flight to Harrogate? At the same time, we glimpse Teresa/Agatha through the eyes of Harry another hotel guest. He is intrigued by the sad, mysterious and elusive Teresa, who he thinks is somehow false. He is a rich widower and is very attracted to Teresa, however after reading a newspaper article he is convinced that she is the missing author Agatha Christie, a wife and mother. Nevertheless, they continue to meet, dance and enjoy each other’s restricted clandestine company. “Gentle sunshine in a cerulean sky. Benign clouds that might have drifted from an illustration in a children’s storybook. Harrogate was a salubrious, superior place, time itself seeming to progress smoothly there, coasting. The style is also fitting for a story about the ‘idle’ rich on holiday in a tourist town. Apart from the obvious plot concerning Agatha Christie’s disappearance, the issue of mental health is apparent throughout the story. In particular, each of the four main characters are still grieving for the loss of a spouse, a relationship or of a child and each serves to display how grief can affect the mental health of a person long after their loss. Fictional account of how Agatha Christie spent the 11 days she went missing in the 1920s, focussing on a romance. We will never know what really happened but I'm sure it wasn't as romantic as depicted in this book. It’s of course obvious that when choose a book it is with a certain expectation of what we will find within the covers. Maybe it is a book we have read before, a favourite author that we love spending time with or a fairly new author tackling a subject that we are particularly interested in. For me, identity and memory fascinates me and quite early in my serious reading career I tackled Agatha Christie’s autobiography and also her novels under the name of Mary Westmacott. It is quite common know It’s of course obvious that when choose a book it is with a certain expectation of what we will find within the covers. Maybe it is a book we have read before, a favourite author that we love spending time with or a fairly new author tackling a subject that we are particularly interested in. For me, identity and memory fascinates me and quite early in my serious reading career I tackled Agatha Christie’s autobiography and also her novels under the name of Mary Westmacott. It is quite common knowledge even now that Agatha Christie disappeared for 11 days in December 1926. Theories abounded of course. One that it was a publicity stunt for her latest book, another that she was suffering from a rare type of memory loss known as the fugue state. Some even thought it was just a way of escaping a marriage in crisis. Having read Thornell’s excellent first novel on the painter Clarice Beckett I felt sure which narrative line Thornell would take and was stopped dead in my tracks when she didn’t. I actually had to put the book down for a while because of sheer disappointment. When I finally picked it up again I’m afraid the spell was broken and I seemed to stumble over phrases that I’m sure Christie herself would never have considered using: “the muscular desire for travel”, “her jellied understanding was setting”, “the agreeable disorientation”, “flustered fluttering” and “wobbly inspiration”. I can’t help but wish that we could have had more of Agatha Christie’s flight from Ashfield instead of Harry but then that would have been quite a different novel. Agatha Christie disappeared for a time, and this book is an imagining of her trip away. It was very well considered, and I thought the empathetic person she met on her travels was well created. A few moments that were strange, the rest was good. In 1926 Agatha Christie disappeared for eleven days. What happened? In this fictionalised account Christie suffered one too many setbacks and took herself to Yorkshire. There she renames herself Teresa and begins living a different story. Teresa manages to keep to herself and forget her real persona. She takes in the healing processes recommended for her. Her real identity becomes an issue when she begins associating with other guests on a regular basis. As her memory begins to return, Teresa ha In 1926 Agatha Christie disappeared for eleven days. What happened? In this fictionalised account Christie suffered one too many setbacks and took herself to Yorkshire. There she renames herself Teresa and begins living a different story. Teresa manages to keep to herself and forget her real persona. She takes in the healing processes recommended for her. Her real identity becomes an issue when she begins associating with other guests on a regular basis. As her memory begins to return, Teresa has mixed feelings between wanting to go back to her old life and heading into undiscovered territory with someone new. I just wanted to jump on Goodreads and let you all know about how much I am enjoying this book On the Blue Train - I am about half way through and I am loving the depth of the two main characters. The background characters are pretty interesting also and are helping the story flow. I don't get to read as often as I would like but I am always turning to this book when I do have time because I am looking forward to seeing what happens with the main female character! Will be back when I finish to let I just wanted to jump on Goodreads and let you all know about how much I am enjoying this book On the Blue Train - I am about half way through and I am loving the depth of the two main characters. The background characters are pretty interesting also and are helping the story flow. More literary that the other two that I read recently - this was definitely a slow train. Little in the way of plot- and slow character development. I also found a reference to a duvet in 1926 (page 38) was disconcerting as I don't think the term was in usage in that era.